Square Enix’s music/RPG hybrid Theatrythm Final Fantasy is set for a US release of July 3rd, 2012. Theatrythm looks as if it’s going to be a very unique title–it in essence combines the gameplay of music games (such as Harmonix’s Amplitude) with old-school Final Fantasy RPGs. Update: Check out our Theatrythm Review. The game features yet another conflict between deities Chaos and Cosmos, as previously seen in the Dissidia: Final Fantasy series of fighting games. Like in Dissidia, the game pools heroes and characters together from nearly every aspect of Final Fantasy lore. Unlike Dissidia, however, said heroes aren’t being pitted against each other or their respective rivals–they’re squaring off against some of the more famous beasts from across the Final Fantasy franchise. One key thing to note is the art direction in Theatrythm. 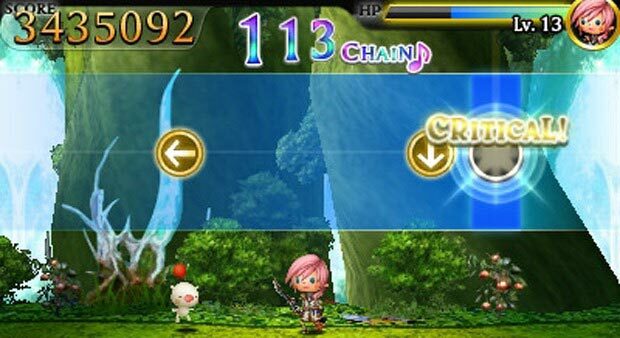 To liken it to a ‘kid-friendly’ rendition of the Dissidia games wouldn’t be inaccurate. Specifically, the heroes depicted in the game are Chibi versions of their regular artwork. Even the monsters and bosses you face off against are getting the cute treatment. Of course, for this rhythm/RPG hybrid to work, you’d need troves of well-loved, quality pieces of music. Thankfully, the Final Fantasy series just may have the largest catalog of renowned game soundtracks in the history of video gaming. 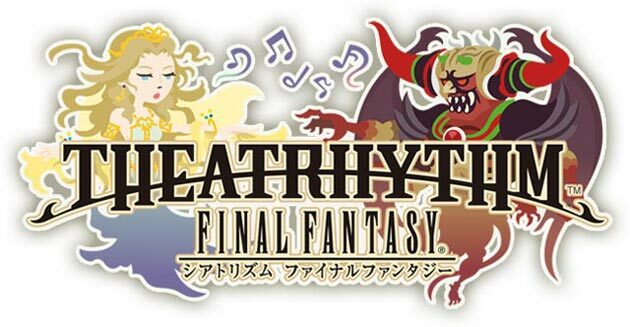 At least three of each Final Fantasy main series games’ best known pieces of music are featured in Theatrythm. Each piece falls into a separate category: field, battle, and event. For example, Final Fantasy V’s ‘Four Hearts’ represents that game’s field music, while ‘Battle on the Big Bridge’ shows up as its battle music. There have even been reports of DLC in the works, which will supposedly add even more tracks to the game’s already impressive library. This in itself is notable, as it will effectively be the first bit of 3DS DLC to be released, period. Gameplay is split between field and battle modes. These are aesthetically different, but what you’re physically doing is exactly the same between both. The top screen contains the in-game action, and shows different directional arrows that move from left to right. As they move toward the right end of the screen, you either swipe or tap your stylus on the bottom screen in the indicated direction. 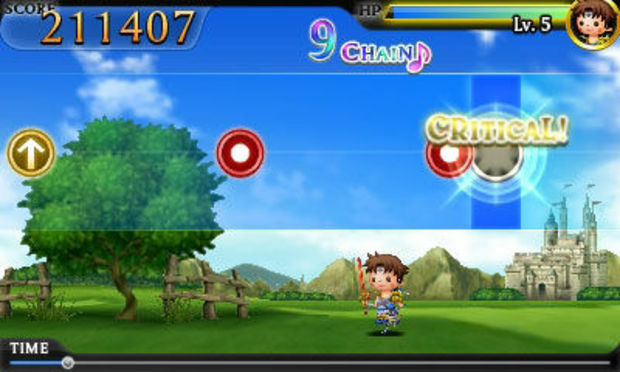 During battles, you control a party of up to four. Battles are shown as you’d see them throughout any older Final Fantasy title; the monster/boss is on the left, and your party is on the right. As notes and indicators move towards your characters, performing the correct stylus maneuver will damage your opponent—this is how you attack. It is also possible to use summoned monsters during battle. These include standard FF appearances, such as Ifrit, Shiva, etc. Field sequences, on the other hand, merely feature your lead character walking through environments based on the various Final Fantasy games. You still interact with the music during these parts of gameplay, however. It was announced on April 19th that the North American pre-order bonus for Theatrythm will include a high-quality, Final Fantasy-themed stylus for your 3DS, complete with stickers depicting the game’s characters to decorate it with. There are reportedly seventeen different stickers that come in the kit. What character will you put on your stylus? Let us know in the comments below, and keep it here at inMotion Gaming for a full review after the game launches on July 3rd. PS: If you enjoyed this article, help spread the word by clicking the “Like”, “Tweet”, “+1” buttons, or sharing it using the share icons below. Want to read more articles like this? Subscribe to our Updates, and get our articles directly to your inbox or RSS reader. I’m pretty sure I would BUY a 3DS just to play this if it reviews well. How awesome would it be to play a rhythm game as Cloud? Very. Busting enemies up while tapping along with the beat of the song is completely satisfying, especially while playing as Cloud.